But they certainly don’t have to. Google treats each URL above separately (and equally) regardless of whether it’s a file or a directory, or it contains a trailing slash or it doesn’t contain a trailing slash. From a technical, search engine standpoint, it’s certainly permissible for these two URL versions to contain different content. Your users, however, may find this configuration horribly confusing -- just imagine if www.google.com/webmasters and www.google.com/webmasters/ produced two separate experiences. don’t both return a 200 response code, but that one version redirects to the other. If only one version can be returned (i.e., the other redirects to it), that’s great! This behavior is beneficial because it reduces duplicate content. In the particular case of redirects to trailing slash URLs, our search results will likely show the version of the URL with the 200 response code (most often the trailing slash URL) -- regardless of whether the redirect was a 301 or 302.
meaning that both URLs return 200 (neither has a redirect or contains rel=”canonical”), and you want to change the situation? Choose one URL as the preferred version. If your site has a directory structure, it’s more conventional to use a trailing slash with your directory URLs (e.g., example.com/directory/ rather than example.com/directory), but you’re free to choose whichever you like. Be consistent with the preferred version. Use it in your internal links. If you have a Sitemap, include the preferred version (and don’t include the duplicate URL). 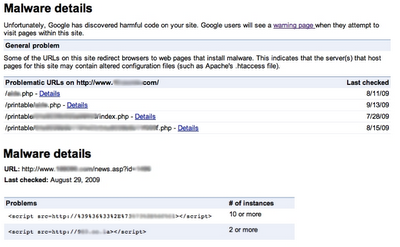 Use a 301 redirect from the duplicate to the preferred version. If that’s not possible, rel=”canonical” is a strong option. rel=”canonical” works similarly to a 301 for Google’s indexing purposes, and other major search engines as well. are behaving as expected. The preferred version should return 200. The duplicate URL should 301 to the preferred URL. Check for Crawl errors in Webmaster Tools, and, if possible, your webserver logs as a sanity check that the 301s are implemented. Profit! (just kidding) But you can bask in the sunshine of your efficient server configuration, warmed by the knowledge that your site is better optimized. and request that they remove or block the content in question. If the website owner removes a page, requests for the removed page should return a "404 Not Found" response or a "410 Gone" response. 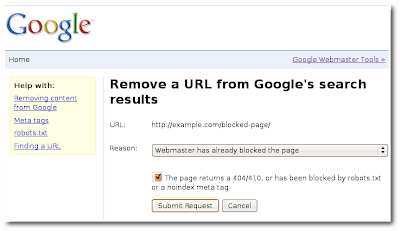 If they choose to block the page from search engines, then the page should either be disallowed in the site's robots.txt file or contain a noindex meta tag. 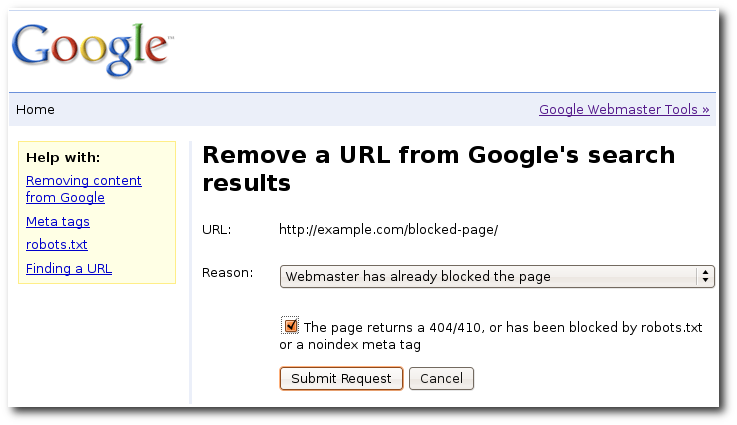 Once one of these requirements is met, you can submit a removal request using the "Webmaster has already blocked the page" option. Sometimes a website owner will claim that they’ve blocked or removed a page but they haven’t technically done so. If they claim a page has been blocked you can double check by looking at the site’s robots.txt file to see if the page is listed there as disallowed. Another place to check if a page has been blocked is within the page’s HTML source code itself. You can visit the page and choose “View Page Source” from your browser. Is there a meta noindex tag in the HTML “head” section? If they inform you that the page has been removed, you can confirm this by using an HTTP response testing tool like the Live HTTP Headers add-on for the Firefox browser. With this add-on enabled, you can request any URL in Firefox to test that the HTTP response is actually 404 Not Found or 410 Gone. Once you've confirmed that the content you're seeking to remove is no longer present on the page, you can request a cache removal using the 'Content has been removed from the page' option. This type of removal--usually called a "cache" removal--ensures that Google's search results will not include the cached copy or version of the old page, or any snippets of text from the old version of the page. Only the current updated page (without the content that's been removed) will be accessible from Google's search results. However, the current updated page can potentially still rank for terms related to the old content as a result of inbound links that still exist from external sites. 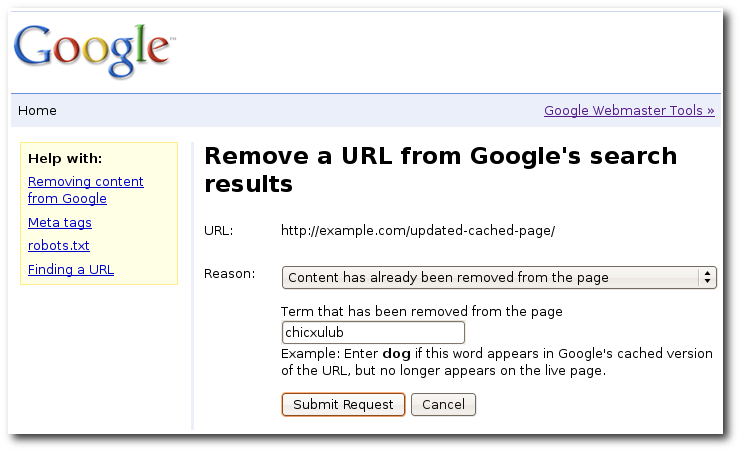 For cache removal requests you’ll be asked to enter a "term that has been removed from the page." Be sure to enter a word that is not found on the current live page, so that our automated process can confirm the page has changed -- otherwise the request will be denied. 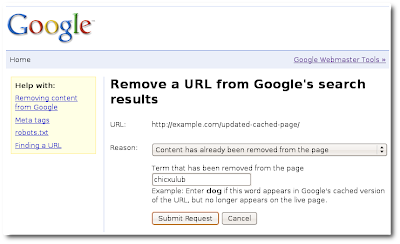 Cache removals are covered in more detail in part two of the "URL removal explained" series. 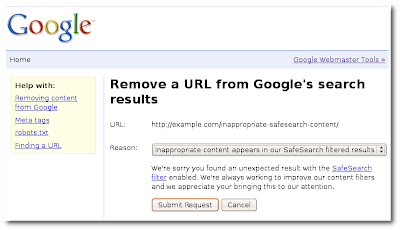 Google introduced the SafeSearch filter with the goal of providing search results that exclude potentially offensive content. For situations where you find content that you feel should have been filtered out by SafeSearch, you can request that this content be excluded from SafeSearch filtered results in the future. 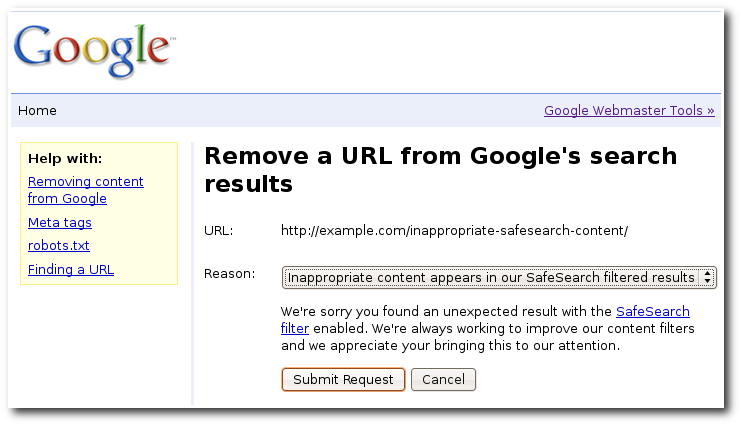 Submit a removal request using the 'Inappropriate content appears in our SafeSearch filtered results' option. If you encounter any issues with the public URL removal tool or have questions not addressed here, please post them to the Webmaster Help Forum or consult the more detailed removal instructions in our Help Center. If you do post to the forum, remember to use a URL shortening service to share any links to content you want removed. Welcome to the third episode of our URL removals series! In episodes one and two, we talked about expediting the removal of content that's under your control and requesting expedited cache removals. Today, we're covering how to use Google's public URL removal tool to request removal of content from Google’s search results when the content originates on a website not under your control. Sometimes a situation arises where the information you want to remove originates from a site that you don't own or can't control. Since each individual webmaster controls their site and their site’s content, the best way to update or remove results from Google is for the site owner (where the content is published) to either block crawling of the URL, modify the content source, or remove the page altogether. If the content isn't changed, it would just reappear in our search results the next time we crawled it. So the first step to remove content that's hosted on a site you don't own is to contact the owner of the website and request that they remove or block the content in question. 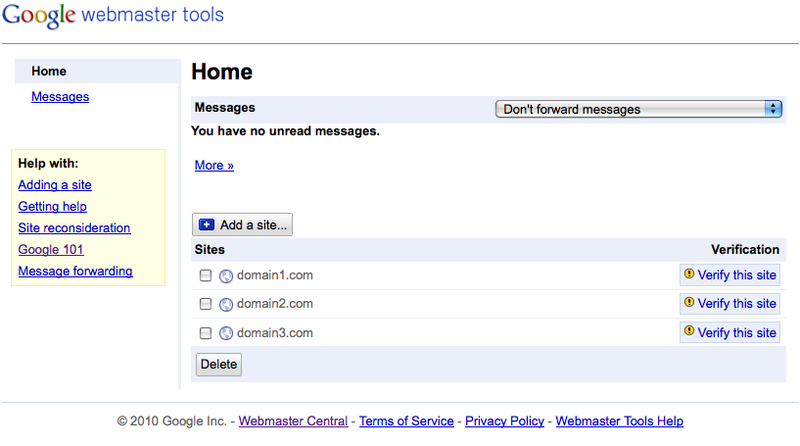 on the Official Google Blog, we’ve taken an additional step to improve access to Google webmaster services. Parallels, one of the leading providers of control panel software to hosting companies, has integrated Google Services for Websites into Parallels Plesk Panel, used by millions of website owners globally to manage their websites. If you use Plesk for managing your hosting and website services, you can easily configure Webmaster Tools, Custom Search, Site Search, Web Elements and AdSense for your website right from within Plesk. Since Plesk knows what domains you own, it automatically registers your domains to Webmaster Tools and allows you to automatically login to the Webmaster Tools console to verify your sites, as shown below. We’re always trying to make our tools easier to use and easier to access. Since you’re probably visiting your hosting control panel on a regular basis, we hope that you find this integration convenient. 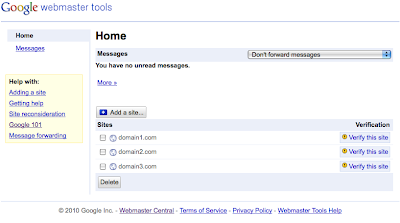 If you have feedback please let us know in the Webmaster Forum. Today, as announced on the Official Google Blog, we’ve taken an additional step to improve access to Google webmaster services. Parallels, one of the leading providers of control panel software to hosting companies, has integrated Google Services for Websites into Parallels Plesk Panel, used by millions of website owners globally to manage their websites. It used to be that you could only see Top search queries data for your site's top 100 queries. 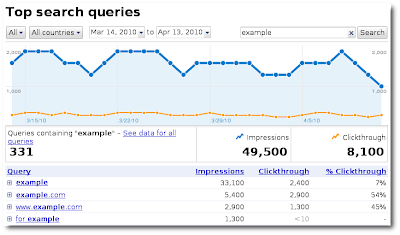 We’ve significantly increased the number of queries we show. Now if your site ranks for more than 100 queries, you’ll see new pagination buttons at the bottom of the Top Search Queries table allowing you to page through a much larger sampling of the queries that return your site in search results. Previously, if you wanted to visualize your Top search queries data you could download your site's data and generate your own charts. To save you some time and effort, we're now generating a chart for you, and displaying it right within the page. The Top search queries chart includes a date range selector similar to what Google Analytics offers. So now if you really want to see what your site's top search queries were for a particular week in the past, you can see the data for just that slice in time. Finally, for sites that have numerous keywords that change frequently, we’ve added the ability to search through your site’s top search queries so that you can filter the data to exactly what you’re looking for in your query haystack. We hope you enjoy these updates to the Top search queries feature and that it's even more useful for understanding how your site appears and performs in our search results. If you've got feedback or questions about the new Top search queries, please share your thoughts in our Webmaster Help Forum. We've got good news for site owners who are frequent users of the Top search queries feature in Webmaster Tools: we’re now providing more detailed data for each individual search query. We previously just reported the average position at which your site’s pages appeared in the search results for a particular query. 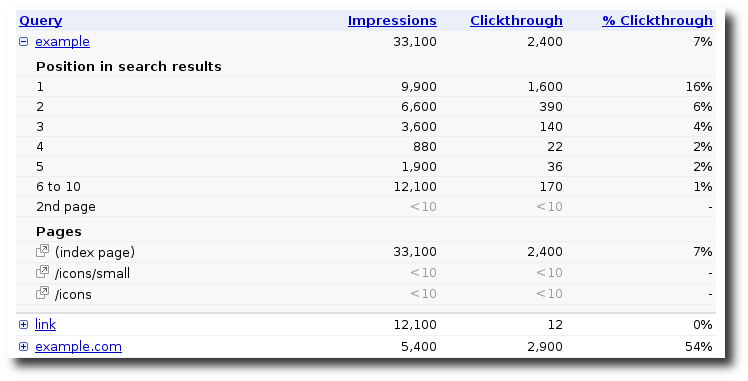 Now you can click on a given search query in the Top search queries report to see a breakdown of the number of impressions and the amount of clickthrough for each position that your site’s pages appeared at in the search results associated with that query. 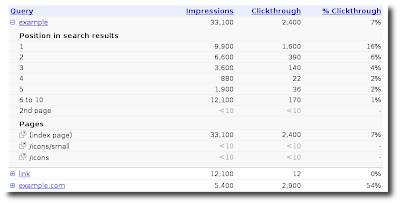 Impressions are the number of times that your site’s pages appeared in the search results for the query. 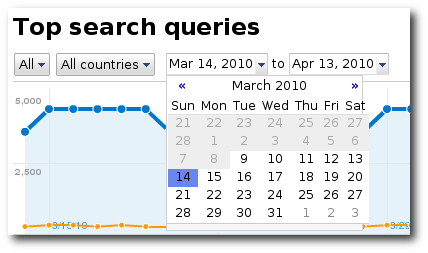 Clickthrough is the number of times searchers clicked on that query’s search results to visit a page from your site. In addition to impressions and clickthrough numbers, you’ll also see a list of your site's pages that were linked to from the search results for that search query. As we went about increasing the amount of data available, we also implemented measures to increase the detail of the data overall.
. The clinics covered real problems on real sites, and we posted the results on the Spanish Webmaster Central blog. If you read Spanish, I recommend you go read the different posts covering everything from issues with framed sites, to more technical domain setup. In some countries we don’t have dedicated webmaster-focused blogs, but we still want to help webmasters in those countries. That means that you might occasionally see site clinic or webmaster-related posts on AdWords blogs such as the forthcoming ones on the Nordic AdWords blogs (which cover Danish, Finnish, Norwegian and Swedish). Recently when we posted some advice for webmasters on one of our AdWords blogs, we received questions about the relationship between Google’s search and advertising programs. We wanted to again reassure our users that the ranking of Google’s organic search results is entirely separate from our advertising programs. Furthermore, we do not give any preference to AdWords customers in our site clinics - everybody is welcome to participate. We’re simply posting this on local “AdWords” blogs because it’s the best way for us to reach webmasters in those communities and languages. We try to communicate with webmasters in lots of different places. For example, when we send representatives to conferences we’re happy to participate in public site clinics where we share best practices on how to improve the crawlability and site architecture of websites suggested by the audience. However, we also want to help users who can’t or don’t want to attend search conferences. To reach more people, we started doing free virtual site clinics in languages other than English. These site clinics help site owners make websites in such a way that they are more easily crawled, indexed, and returned by search engine crawlers, which in turn helps webmasters gain more visibility on the web. We did a series of free virtual site clinics in Spanish last year which spanned 5 blog posts. The clinics covered real problems on real sites, and we posted the results on the Spanish Webmaster Central blog. If you read Spanish, I recommend you go read the different posts covering everything from issues with framed sites, to more technical domain setup.